The information technology sector offers many graduate jobs and some of the highest starting salaries. IT professionals perform a variety of duties that range from installing applications to designing complex computer networks and information databases. A few of the duties that IT professionals perform may include: Data management, Computer networking, Computer engineering, Database systems design, Software design, Management of information systems, Systems management or System administration. The Department of Information Technology took initiative in enriching knowledge and latest developments in IT industries by providing training both for faculty and students to get certification in IBM DB2, EMC proven professionals certification in information storage and management. Also the faculties are attending Faculty Development Program, Workshops, Short term course etc to update their skill in order to shape the young budding IT professionals in the current area of requirements. To emerge as a Premier Institute in the field of Engineering & Technology by providing Quality Education, Research and Managerial skills to cater the need of Industry & Society, upholding ethical principles. To impart Quality Education in emerging technologies to meet out the industrial needs. To involve in research and innovation with social impact. To develop personality and leadership skills among students. To inculcate the students with values of ethics. M4: To serve the Community and the Profession. To build and sustain strategic research group of excellence that influence existing university strengths, match well with future directions of the university, offer good career opportunities for graduates. To promote the protection, transferring, and commercialization of intellectual property, and develop links to economic development in national and international level, advancing translating research into practice and other initiatives with major economic and societal impact. To promote alignment and optimization of graduate programs with respect to the strategic research group, including through development of distinctive doctoral programs, and to expand research opportunities and resources that attract and support a robust number of postdoctoral fellows. To be the best research institute by conducting world-class research with creative activities that develop knowledge and contribute to the economic growth and social advancement of nation and benefit humanity as a whole. To identify, ensure, establish and assist the innovative research programs with efficient planning and evaluation to build national and international knowledge about socio-economic development. To promote research in today's Technologies like Big data, Data mining, Cloud Computing, Data Analytics, Sensor Networking, Cyber Security etc., and to derive and deploy Innovative and Practical solutions for exciting real world problems. The main vision of this laboratory is to establish the state of the art in real-time computing and to explore and develop the next generation real time system, using this to make students industry ready in terms of knowledge acquisition, research and placement. 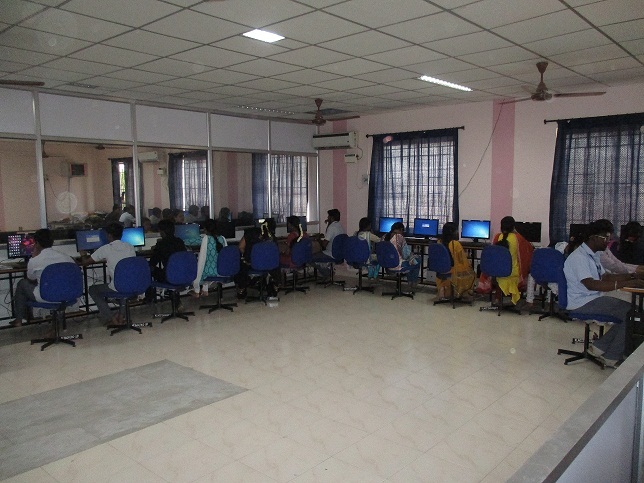 Our lab focuses on Developing Machine Learning and Big Data Algorithms to solve the application in Health Informatics, Tamil computing, Environmental Hazards Detection using Sensor Networks, Information Retrieval and Computing Sustainability. Using open stack a private cloud infrastructure was established in lab. Using Amazon AWS-VPC a virtual network scenario is established. Data Analytics for Health Care. Resource Scheduling and Management in Heterogeneous distributed Environment with efficient resource discovery mechanism. Optimal & Novel feature selection Technique for effective Data classification. Enhance and evaluate the reliability of web services. Design and Evaluation of Ambient Air Pollution in Road Traffic Using Cloud Computing. Dr.APJ Abdul Kalam Award for Scientific Excellence -2015 Contribution made in the field of Data Mining Research. Students of IT Department have received Honâ€™ble Chief Ministerâ€™s Award of Excellence in E-Governance 2015-2016 district level first place. Students of IT Department has won first place in Zonal level Paper Presentation contest of Innovation of Engineering & Technology '16 conducted by Recruitment Analysis Council (RAC) supported By National Cyber Defense Research Centre - New Delhi. Graduates are prepared to be responsible computing professionals in their own area ofÂ interest.